Bright ruby-garnet in colour with an intense nose, perfumes of dark fruit and a touch of cloves with a savoury, herbal note. On the palate it is full-bodied yet elegant, with plenty of robust but ripe tannins supporting the dark, dried plum and autumn compote fruit character and balancing the acidity. Long and fine, with perfumes of roses and violets on the finish. Collect your order from our Wimbledon shop, Monday to Saturday. Collect your order next day from a local UPS Access Point®. Orders placed after 1PM on Thursday will be delivered on the following Tuesday. Orders placed by 1PM weekdays are carefully packed and sent via APC to the address of your choice. Orders placed after 1PM on Thursday will be delivered on the following Tuesday. Orders placed by 1PM weekdays can be dispatched for next morning delivery, and those placed by 1PM on Friday can be dispatched for Saturday delivery by APC. We can deliver your goods next day to an address of your choice in the Highlands, off-mainland UK postcodes, Northern Ireland, Republic of Ireland and Europe. See our delivery page. We can deliver your goods to an address of your choice around the world. See our delivery page. Piedmont is in Italy's northwest and borders Switzerland and France. True to the meaning of its name (foot of the mountain), Piedmont is a land of mountains. It is surrounded on three sides by the Alps, with the highest peaks and largest glaciers in Italy. Monviso, the Piedmont side of Monte Rosa and the other spectacular mountains in the region, create incredibly beautiful landscapes, and ski resorts abound: Via Lattea and Sestriere welcome winter sports enthusiasts with their state-of-the-art facilities. The Alps form the background for sweeping, picturesque valleys, e.g. the Val di Susa, Valsesia and Val d'Ossola. The landscapes of the Langhe and Monferrato are hilly, rather, but just as beautiful, a succession of cultivated hills and vineyards that are dotted with small towns and castles. Expanses of water and rice paddies, long rows of poplars and old farmhouses make up the typical scenery of the plains around Novara and Vercelli. Lake Maggiore is the most sought-after tourist resort, including Stresa and the Borromean Islands, charming as they are with their ancient villas surrounded by beautiful lawns and gardens. Yet nature is only one of the many attractions in Piedmont. This region has many other facets: from Turin — the Italian car manufacturing capital – with its history and remarkable cultural heritage, to other cities such as Cherasco, Alba and Ivrea. Next up are the intriguing Medieval castles — like the imposing fortress at Ivrea, and prized works of architecture — the famous Residences of the Royal House of Savoy and the Sacri Monti (Sacred Mountains) certainly deserve to be mentioned. The famous spa resorts of Acqui Terme and Vinadio offer treatments and therapy for a relaxing, reviving holiday. Discoveries and surprises of all kinds are in store for visitors to the region, including a wide range of food and wine to suit every palate. 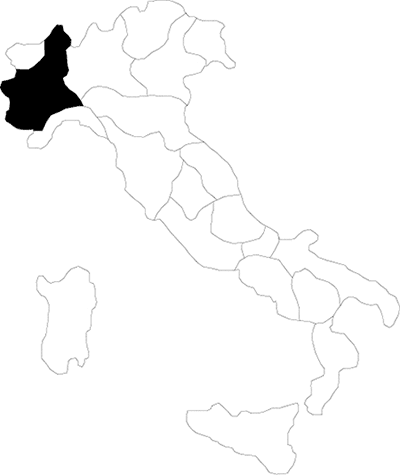 The region’s provinces are: Turin (regional capital), Alessandria, Asti, Biella, Cuneo, Novara, Verbano Cusio Ossola and Vercelli. If you have an allergy or intolerance please let us know.